If you want to mingle with the locals in Malta, there is nowhere better than at the Maltese village festa (or feast). The Maltese love their patron saints and the village festas, being primarily a religious celebration, are held in their honour every year. Each village celebrates a different patron saint or two depending on the number of churches in the locality. Each church is dedicated to a different saint. For this reason, some villages celebrate more than one festa per year. The village band clubs, at times in collaboration with the members of the parish, are tasked with the organisation of the festa. The competition between the band clubs can be quite fierce when it comes to the organisation of decorations and the fireworks shows, even if there is only one festa in the village. It gets even tougher when the locality celebrates two different patron saints, each honoured by an individual band club. The festas are held over the summer months. This is a time of great merrymaking for the local community. In fact, there are a lot of traditions and customs associated with the festa. I’ll give you a fair warning if you’re thinking of witnessing one: If you’re used to a mellow lifestyle, attending the festa can be a bit of a culture shock as it can get really noisy and loud. What’s a Village Festa Like? The tradition of the festa started under the rule of the Knights of St John, specifically under Grandmaster De Rohan who ruled the order between 1775 to 1797. Certain villages having mulitple parishes celebrate two patron saints whilst others celebrate only one. Sometimes multiple villages/parishes celebrate the same festa. For example, the Santa Maria feast is celebrated on the 15th August in 7 localities. The key parts of a Maltese village festa are: Religious processions, band marches, community gathering, fireworks and traditionally sweets (and nowadays fast food). The actual schedule of events around Maltese village feasts tends to be different between different parishes and localities. Although I’ll take you through a rough outline, it’s not always easy to find out what the exact program is for a festa that you’d like to attend. Your best bet is to keep an eye on the local parish’s Facebook page (Yes, you read that correctly) around two weeks before the day of the festa. Festa celebrations sometimes even begin or start two weeks prior the day of the celebration with Church activities. These usually involve the Christening of babies and a celebratory children’s mass. The Marċ il-Kbir (Big March) usually happens on the eve or two days before the festa. The show with the Catherine wheels usually takes place twice during the festa. The bigger show usually happens on the eve or on the day of the festa. The day of the festa is celebrated all day starting with a march in the morning. Festa aficionados often get so drunk that they can barely make it home in the afternoon to come out and celebrate the patron saint in the evening. The evening of the day of the festa, the statue of the patron saint is carried out of the Church and back inside. On its way back, it is met with great cheers and applause from the crowd. Confetti, balloons and streamers are launched from the rooftops and balconies. Fireworks light up the sky and an inscription with the name of the patron saint is lit across the steeple of the Church. Lots of colours, lots of sound and lots of locals for starters. Religious relics and damask tapestry adorn the inside of the Church during the festa. The statue of the patron saint is placed at the centre. The square is usually full of festoons and pavilions usually in the shape of enormous Spanish fans with woven images of the celebratory patron saint. These adornments usually take a whole year’s work to prepare, usually done by men and women (members of the local band clubs), who take it upon themselves to set up the pyrotechnics and other embellishments related to the festa. There are also the steeple jacks, who risk their lives decorating the dome of the Church with heavy candy light. On the side of the Church, you can usually find the ground pyrotechnic work. The men in charge of the fireworks, petards, musketterija or firing of the muskets and the Catherine wheels need to be well-prepared and organised. Showing off between the band clubs when it comes to who has been the most creative, colourful and well-organised is not taken lightly. The occasional festa fight between competing band clubs is also a common occurrence. Every household in the locality contributes to the funding involved in the fireworks. At times local businessmen and politicians also step in to make their own donations, often for some good old fashioned PR among the locals, sometimes also to garner more favours or win potential electoral votes. Once the colours of all the decorations mix with those of the petards and the Catherine wheels (pyrotechnic displays mounted on poles in the streets), nothing becomes more spectacular in Malta than the village festa. If you happen to be flying aboard a plane over Malta on a summer night, there’s a good chance you’ll catch a glimpse of the festivities. During festa week, the main roads and the main square of the locality are usually cordoned off during celebration hours, and sometimes even before. No traffic is permitted through the central part of the locality in these hours. If you are going to the festa make sure you organise your trip there and back beforehand. Unless you are staying in the same locality, finding buses or taxis at night can get tricky. If you want to take the bus to the festa, ask for directions to the centre as chances are, it will stop you a few streets away. If you drive there yourself, expect to have to park on the outskirts. Don’t forget to remember where you parked – old village centres can be a bit of a maze of small winding streets. Keep your distance while watching the fireworks. Although the air fireworks are usually lit up from the outskirts of the village, Catherine wheels (elaborate pyrotechnic displays mounted on large poles in the street) can be pretty close. Keep your distance as the shower of falling petards to the ground can be dangerous. Local band clubs host individual parties inside their club houses, which are usually located close to the parish church. Although the atmosphere is usually jovial, alcohol, summer heat and a passionate extrovert culture don’t always mix well. 😉 If you have any small children, I would not suggest you take them there as it can get very stuffy and it’s not uncommon for a bar fight to break out. If you happen to stay in or near a village celebrating a festa, expect to hear loud firework explosions as early as 8am. Don’t like the sound of that (pun not intended) have a look at the calendar below to change plans! Should you like to dip your feet into festa the light way: I suggest you visit the Mosta feast on the 15th of August. The festa there is more family-oriented and a bit more mellow. If you want to be a bit braver: I would suggest visiting the festa of the Madonna tal-Karmnu in Żurrieq (July) or the feast of its rival, Santa Katerina (first weekend of September). The Żurrieq youths passionately dedicate odes to their patron saint and occasionally do hurl a few insults against their rival faction. Yet, this hardly ever turns violent or obscene. Love fireworks? Head to the Lija feast (first weekend of August) and the Mqabba feast on the 15th of August. They provide the best aerial fireworks show imaginable and they have even won some awards for this. 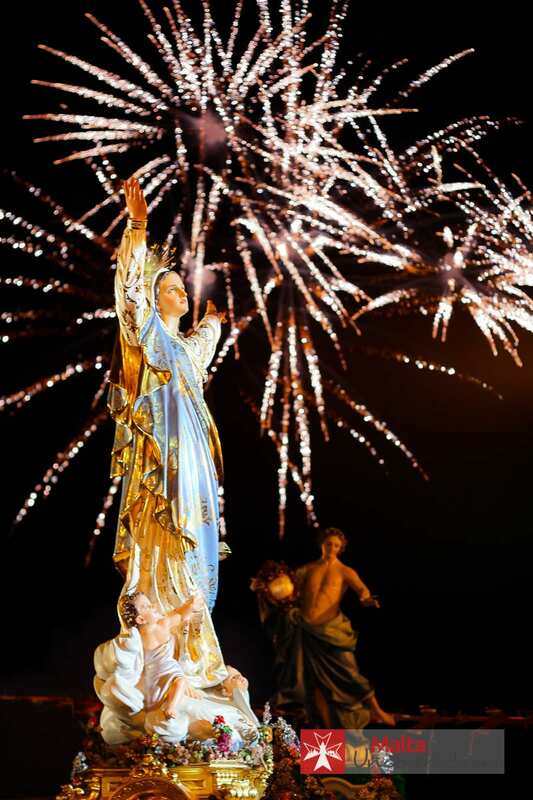 If you happen to be in Gozo in late August: Attend the festivities at Għajnsielem for the feast of Our Lady of Loreto. This is also known as the Feast of the Sun. This festa is held on a smaller scale compared to the two mentioned above, but it is fun nonetheless. 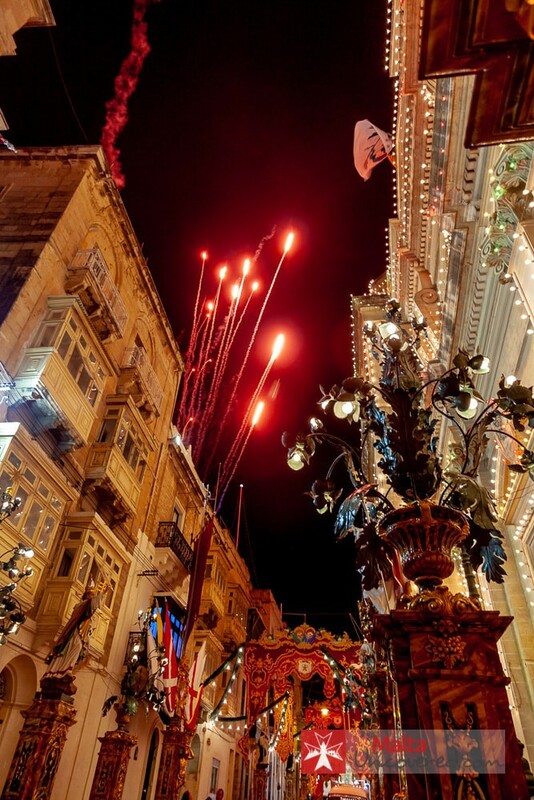 When are the Maltese festi on this year? Here’s an overview of all village feasts by date, showing you which locality celebrates a festa and in honour of which saint. You’ll find that in some localities, like Valletta and Rabat, multiple parishes each celebrate their own festa at different times of the year. Whilst the petards and the Catherine wheel are beautiful to watch, the explosive sounds they emit can be pretty insufferable. Should you suffer from tinnitus or happen to be sensitive to loud noise, you would do better to watch the festa from afar. If you play your cards right and befriend a local who will be nice enough to let you watch it from the rooftop of his or her house. Bars and restaurants around might offer access to rooftops and/or balconies as well to its customers. The marching band during the festa can also be pretty noisy. There is no missing it as usually loudspeakers are placed in the streets surrounding the square. This means that it can be heard from anywhere in the locality. Whilst the Maltese are pretty loud by nature, the noise of the marching band and the petards, combined with an extra drink or two, make them even louder. In the Marċ il-Kbir (big band march) many passionate festa lovers join the marching band to belt out their favourite festa marches or tunes. It all comes together when they stand outside the rival band club – a long standing ‘warring’ custom. They then sing odes to their patron saint and against the rival patron saint. This is a common practice in localities with two patron saints as a way to impassion and animate the crowd. In the week of the festa, diets are usually put on hold as both men and women enjoy their wine and beer. Food stalls line the streets selling . Sweets are sold at food stalls around the centre, with nougat is the most traditional sweet of the festa. There are also the local imqaret (deep fried pastry with dates filling). Increasingly, traditional sweets are making way for fast food as well, so expect to find people tucking into hamburgers with oily chips, hot dogs, deep-fried onion rings, and chicken nuggets. Deep-fried doughnuts are also quite popular. At the festa they are usually in a small looped-shape size. Some people even indulge in six or eight of these at the same time. Granita (semi-frozen sugary dessert, originally Sicilian) and ice-creams are also sold at these kiosks. Toy stalls are also part of the festa bonanza, to keep the kids entertained. Glowsticks, water guns, cheap toys, etc. A village feast is a real outing and a good excuse to dress up and spend time with family. Or with friends and away from family, for young teenagers. The legal drinking age in Malta is 17. Yet, the festa is a good excuse for any local teen below that age to get a friend or a relative to buy him a beer or two. 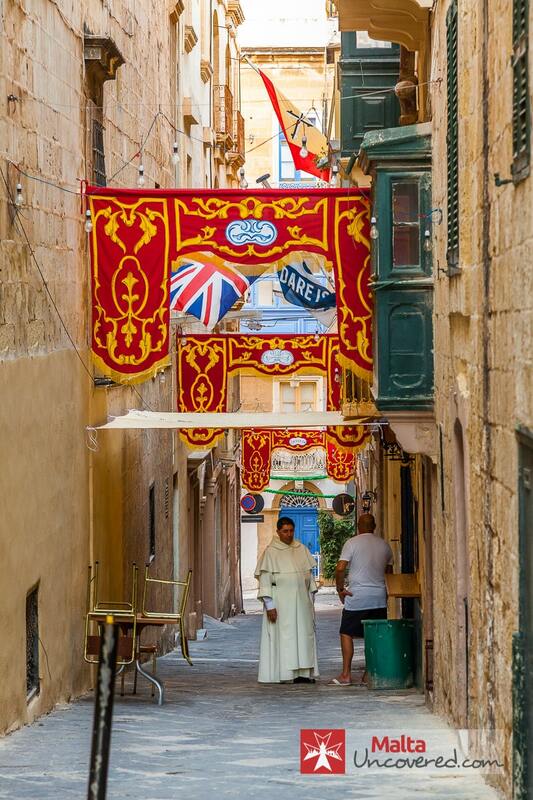 According to Maltese historian PP Castagna, the village festa goes back to the times of the Order of the Knights of St John. Grandmaster De Rohan loved feasts and merry-making. He encouraged the Maltese population to celebrate church activities even outside the church . When it came to music of the festa, string instruments were first introduced. Then the brass band came along, which has become institutional to the Village festa. According to social historian, Jeremy Boissevain, this obsession with the festa sees the coming together of popular and political culture. Clientelism, patronage and political divide have always dominated the Maltese islands. These elements have proved resilient over time. Hello, wonder if you can help. We will be in Mellieha Bay in September, am I correct in thinking that there is a festa on in Mellieha around the 8th September? If so what can we expect to see if we visit? Thanks for your reply in advance. Nigel. Hi Nigel, that’s correct, the local festa will be held on 8th September, which is also a public holiday (il-Vitorja or Victory day, celebrating the victory on the Turkish Empire in the Great Siege of 1565). There’s a bigger-than-usual ramp up to the actual day of the feast with two local band clubs organising several musical programs and marches around different streets within the village centre. Usually in the days leading up to the festa there’d also be several fireworks displays with the biggest show of ground fireworks held near the church the night before (Sep 7th). On the day of the festa itself the celebrations start in the morning with band marches while in the early evening the religious part of the celebration starts, ending at round 10pm followed by air fireworks from the fields around Mellieha. The exact program is usually provided a couple of weeks before the celebration and nowadays the easiest way of getting that is by following the Mellieha local council’s Facebook page. I hope that helps. Hope to be heading there myself this year! Hi, any idea which regions have festa from 10th-24th August? Loved the few we stumbled across last time we stayed, but would like to be able to plan ahead now travelling with 2 littlies! Thanks, fantastic site. Being around during that period means you’ll be here for Santa Marija, which is a public holiday, celebrated on August 15th. That’s pretty much THE festa day in the calendar year, with several localities honouring the Holy Mary, i.e. Mqabba, Qrendi, Mosta, Gudja, Attard, Ghaxaq, Victoria, Birkirkara. I’ve only visited the festa of Mosta and Mqabba on that date and can recommend both, for the celebrations themselves but also for the quality of fireworks (both localities take a lot of pride in their fireworks manufacturing – yes, all that happens locally). Hi Caroline, unfortunately there will be no festa this weekend due to the elections that will be held tomorrow. Under normal circumstances it’d have been the feast of St. Joseph in the village of Hal-Ghaxaq but that’s been postponed to the end of the month I’m afraid.